People trust the Farberware brand, and even better the HF-919B (we’ll call it the 919 for short) is not Farberware’s first venture into the air fryer industry. This air fryer has both a trusted name behind it and experience as well, and it speaks to today’s market. The Farberware 919 comes with a manual and cook booklet. Universal air fryer accessories should fit in it should you desire them. The 919 comes in black. It weighs 11.75 pounds and measures 26.6 x 14 x 13.2 inches. This is an air fryer that you will probably want to leave on your counter, although it isn’t exceptionally large. The basket is 3 quarts, or capable of cooking roughly 2 lbs of food. The basket is nonstick coated and quite easy to slide in and out of the machine. The Farberware 919 could be called a ‘medium sized’ machine, with a capacity suitable for couples or smaller families. With its remarkably low price point, it would be the perfect air fryer for a single person who likes to cook ahead or entertain. This economical, practical air fryer is a manual model, which has proven popular among customers. 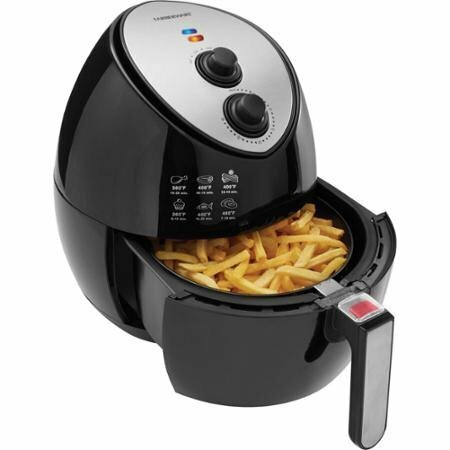 In fact, with the Farberware brand and a 2-year warranty behind it, and may prove to be a gold standard in air fryers. This solid machine is manual, with temps going up to 400 degrees and a timer that works for half an hour, which is enough time to air-fry any type of food. We are developing a slight preference for manual machines as digital machines may develop electronic problems. Perhaps other consumers have noted this also, as we are seeing more and more new manual machines on the market. The Farberware 919 has three outstanding, and important, features, which are the price, the brand name, and the remarkable warranty. The prices of air fryers are dropping, as happens with many new appliances, and for its price point and in its class the 919 is a remarkably good deal. We had more problems finding drawbacks to this air fryer than anything else in researching it. If you have strong reasons to need a huge air fryer, that could count as a drawback, although the 919 is fairly roomy. This apparently is a ‘first’ air fryer for many customers, who had perhaps waited for a name brand to offer a cost-efficient model, and people love it. Nobody seems to miss digital controls, which doesn’t surprise us. It’s entry level and we love it. We’ve found that the number one complaint among first time air fryer owners stems from the difficulties of cooking with a new type of appliance. Other than this sort of issue reported occasionally, we found no complaints about manufacture or appliance quality. We were surprised that some people complained about price when this unit is so inexpensive, but it can be found on the shelf at Walmart. The Farberware 919B has a 2-year warranty, the longest of any air fryer we have reviewed. The basket itself is only warrantied for 90 days, which is still remarkable as many air fryers have shorter warranties for the entire unit. What are the best features of this product? Should I Buy the Farberware HF-919B? We think this is a terrific entry level machine. True, it isn’t the largest or smallest air fryer on the market and it isn’t digital, but we tend to prefer manual machines and the price point is amazing given the outstanding warranty.